Wet’suwet’en have, yet again, evicted pipelines from their territories! Trails, Pembina, Spectra, and others. Government that no proposed pipelines will proceed in their territories. link or Facebook event information listed above. Vancouver Island Community Forest Action Network. 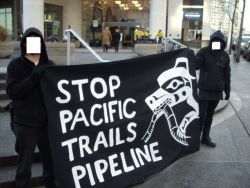 What is Pacific Trails Pipeline? government approved the pipeline’s expanded capacity in April 2012. What are the Unist’ot’en saying? the Wet’suwet’en escorted out PTP drillers and their equipment. What is the Carbon Corridor? Trans Mountain pipeline expansion, are part of a larger energy strategy.